Cambridge, Mass. : Belknap Press, 2014. 512 pp. $35. Motadel's Islam and Nazi Germany's War, recently translated into German as Für Prophet und Führer (2017), illustrates how Berlin worked with Muslims, treating them as allies by appealing to aspects of Islam. It provides useful information for comparison with the Islam policies of other powers, such as Britain and the Soviet Union; in all, it offers a solid academic overview of a multi-faceted topic of great import. Nazis saw Muslims not as threats or enemies but as worthy fighters, admitting them to the SS in 1942 and into the Nazi party in 1943. But, despite the presence of imams and mullahs guiding troops, they were not able to trigger any large anti-Allied uprisings. 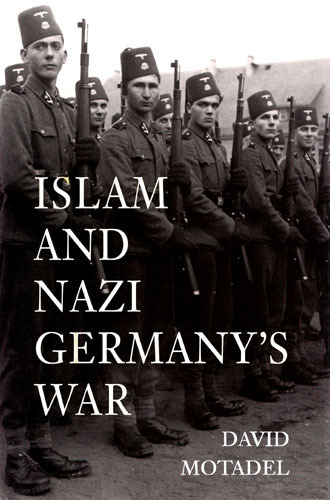 The author does not clearly define Nazi Islam policy, whose guiding principles and goals first emerged in the German-Ottoman axis of World War I. That policy included: allowing only friendly mullahs and muftis to speak and issue jihad edicts in favor of Germany; using Muslim Sufi brotherhoods as platforms for jihad; inciting jihadi revolts among colonized peoples, and supporting Islamic troops with money, arms, and military advisors. Not much changed under the Nazis (who again used Sufi brotherhoods such as the Sanusiya and Qadiriya), except they additionally hired Muslim troops as fighting forces. In all, the Nazis built their axis with Islamists from the base of Germany's earlier Ottoman experience. Motadel shows how, despite the overwhelming greater Nazi power, Islamists managed to sway them in major ways. For example, Hajj Amin Husseini influenced leading Nazis, suggesting themes in German radio broadcasts to the Middle East; advising how to motivate Muslim troops; recommending, even recruiting, Muslim personnel for Berlin's foreign service; advocating an end to all legal Jewish travel to the Middle East; and proposing where to foment conflict in North Africa, the Middle East, and the Balkans. Related Topics: Wolfgang G. Schwanitz | Fall 2018 MEQ receive the latest by email: subscribe to the free mef mailing list This text may be reposted or forwarded so long as it is presented as an integral whole with complete and accurate information provided about its author, date, place of publication, and original URL.